The holiday season is upon us. As a pastor you have planned Christmas Eve services, prepared end-of-year reports, and been invited to more Christmas parties than you care to remember. With all of the activity involved in getting your church ready for Christmas, it can be easy to forget one group – your family. During this season you tend to get busier just as the other members of your family are winding down at work and school. While you see endless tasks to accomplish, they see a window of opportunity to slow down, make memories, and enjoy each other. This season is an opportunity to serve your church, but don’t lose sight of the unique chance to serve and connect with your family. Here are some things you can do to serve your family and connect with them this Christmas season. Help get your home ready for Christmas. You have spent time and energy to get your church ready for Christmas, but have you helped get your own home ready? Make sure you have served your spouse by helping him or her set up the decorations and doing anything else you can to make your home special for the holidays. Check local guides. Most cities will have an online collection point, usually through the local newspaper, for all types of activities you can do with your family that you might not otherwise know about. Look at lights. Grab some hot chocolate, queue the Christmas music, and take in the sights and sounds of Christmas. We have made an annual pilgrimage to the same spot for the past ten years. At this point it’s only a little bit about the lights and a lot about the memories we have made. Get creative. With a little planning and thought you can come up with some really fun activities. One of our family favorites is to go to the mall and split into guys and girls. Each group buys a gift, hides it in the mall, and texts the other group with clues. A few years ago the girls found a key pinned to the back of an ornament on the huge tree in the center of the mall. The key led them to a locker by the ice skating rink where they found necklaces inside. Date your spouse. Your spouse has served you and accomplished a lot this year. This is a great time to look back over the year, celebrate your relationship, recognize the ways God has used you together, and say “thanks” for everything your spouse has done to help you. Date your kids. Every kid has a different idea of what a fun date would be, but all of them long to connect with their parents and have their undivided attention. Think about how to connect with each one of them uniquely and get it on the calendar before it fills up. Game or movie nights. Turn off all of the cell phones and put them in a drawer. Make an intentional effort to be present as you play games or snuggle up and simply be together as you watch movies. Have everyone write down the name of a movie they want to watch and then when you have a couple of hours pull out one and watch it together. Help or serve someone else. Lead your family in praying for a way to serve and bless others. Opportunities abound with local city missions, but some of the best may be with people your family already knows. Bring Advent home. As you lead your congregation through this season of anticipation of Christ’s coming, don’t forget to lead your family. There are several family guides that can be read after dinner at the table and will help focus everyone’s thoughts on why this season matters. Shop early for gifts. Having worked retail during the holidays, I have seen that the closer to Christmas gifts are purchased the more expensive and less thoughtful they become. One easy way to avoid this is capture ideas as you have them throughout the year and keeping a list for each member of the family. Crowd source your ideas. Don’t put pressure on yourself to be a superhuman creative and relational genius. Ask others what they are doing this Christmas season to have fun, make memories, and connect with God and each other. Leverage the last week of the year. 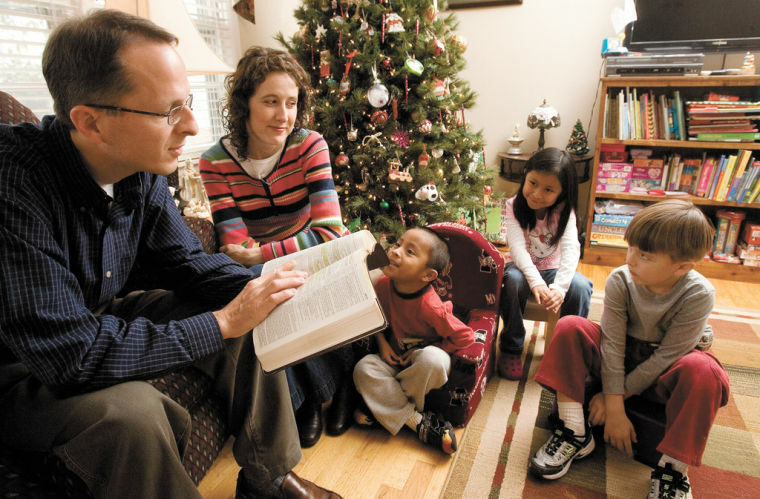 Many pastors are very busy leading up to Christmas and may not be able to spend multiple nights a week drinking cider and making cookies with the kids. However things tend to slow down December 26th. Maybe some of your best activities and creative planning could go into the week after Christmas. God’s church deserves a pastor’s creative leadership during the Christmas season. Your family desires and deserves the same.